I am so, so excited about this giveaway today! Because every year, my husband and I scratch our heads and try to figure out what on earth to put in our kids' Easter baskets. We want to make Easter meaningful for our children - because as Christians, Christ's triumph over death is our greatest joy and hope! But, we also want to make it a really fun day for our kids. I grew up with the Easter bunny coming to my house every year, and my siblings and I loved chowing down on candy every Easter morning. So, what are we putting in our kids' Easter baskets this year? Besides the obligatory Peeps and a small amount of candy. In the spirit of wanting to share with you something special this Easter, I contacted my friends at Zonderkidz and asked them if I could put together an "Easter basket" giveaway for you: A basket filled with books that we love in our family. Books that will make Easter morning special and really fun. Books that will help you focus on the real meaning of the day: Jesus! I hand-picked each item in these baskets - because these are all things I know you will love as much as I do. So, today - you can win one of THREE of these baskets! 1. 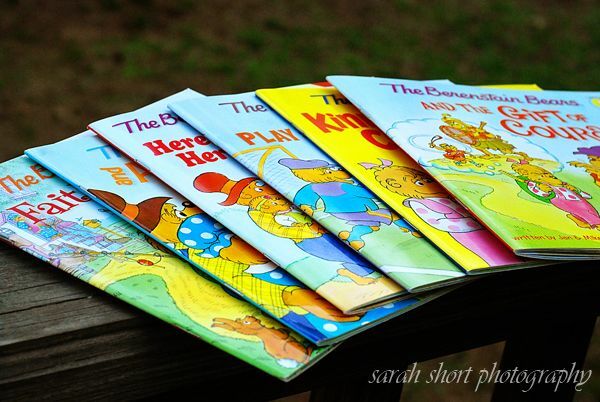 A selection of Zonderkidz Berenstain Bears Books. 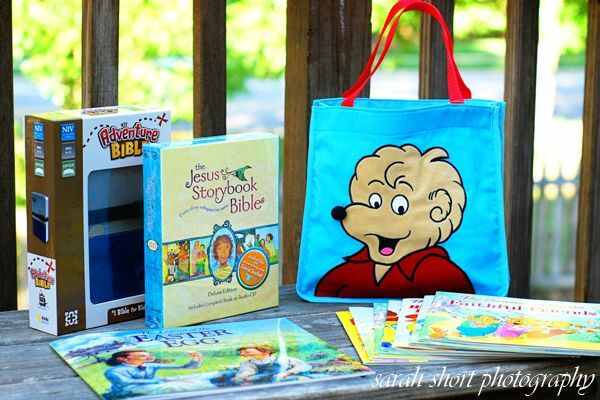 Did you know that Zondervan publishes Christian-themed Berenstain Bears books? They do! And, they are absolutely wonderful! 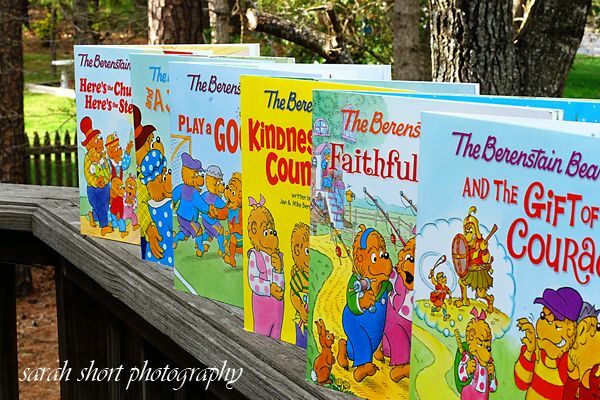 My boys love the Berenstain Bears, and these books focus on working through problems and situations from a Christian lifeview. I love these books! And, so do my buddies. 5. The Berenstain Bears and a Job Well Done. 2. 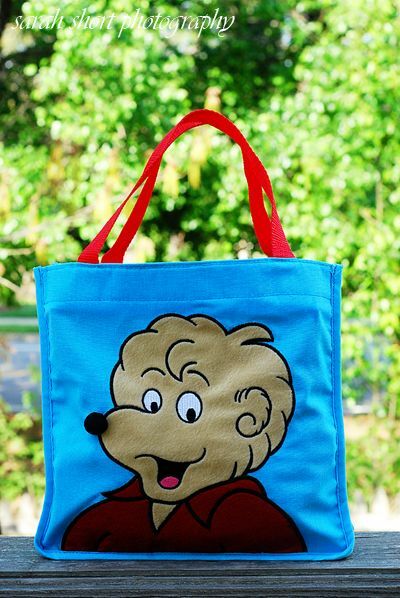 A Berenstain Bears "Brother" or "Sister" Tote . How cute are these? Each cotton/canvas tote has a soft, plush image of either "Brother" or "Sister" Bear on the front. 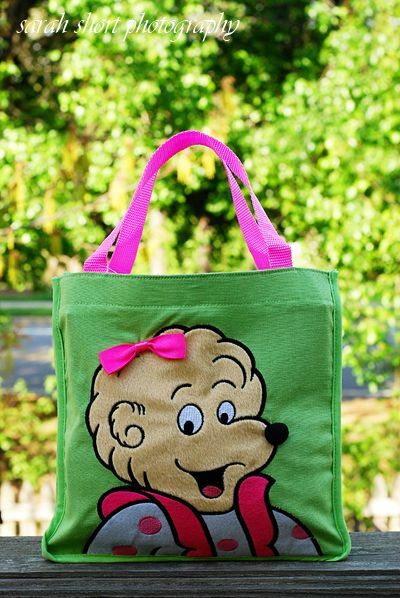 These totes are perfect for carrying your child's new selection of Berenstain Bears books, or toting books to and from the library! "Brother" - in blue and red. "Sister" - in pink and green. 3. The Legend of the Easter Egg. 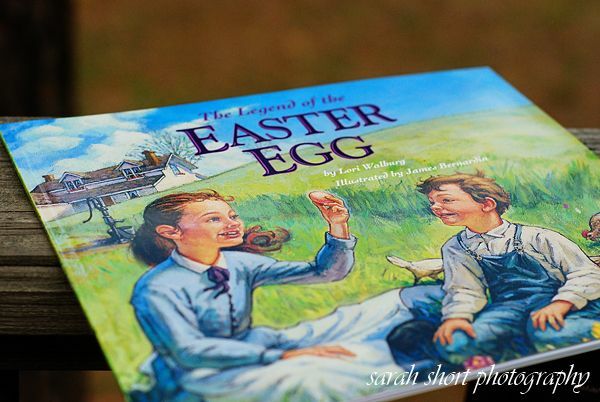 This book - that is an amazing story in helping children understand the true significance of Easter - is so precious, and so moving, and if you love The Legend of the Candy Cane (and its characters), you will love this one, too. 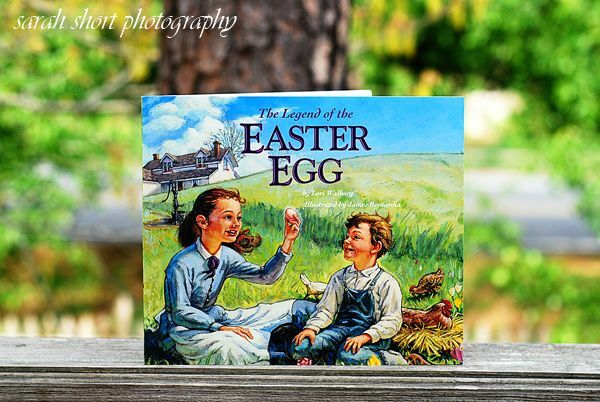 I can't think of a better children's book to read on Easter morning! 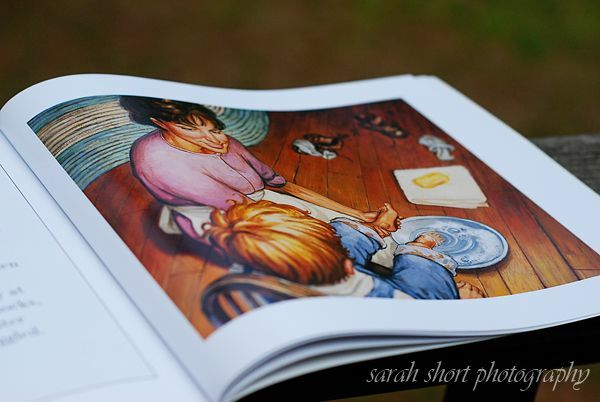 I won't give away the story, but I will tell you that the illustrations - they are magnificent! 4. The Jesus Storybook Bible Deluxe Edition . 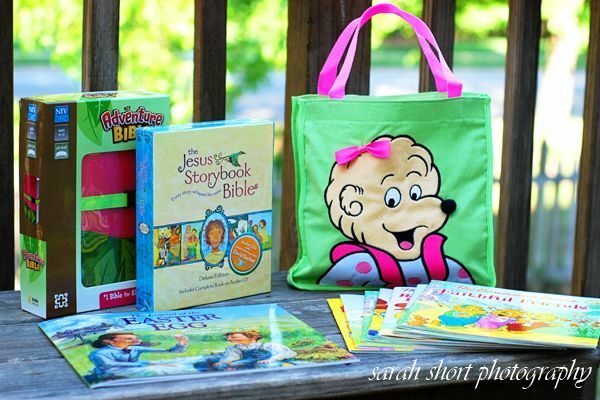 I don't know that I could ever give away a bundle of items for Easter and not include The Jesus Storybook Bible. 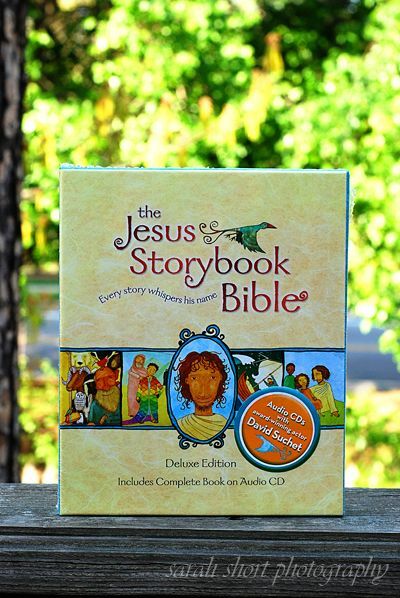 This deluxe edition contains not only a beautiful copy of The Jesus Storybook Bible, but also each story on audio CD. My children listen to these every day at naptime. And, David Suchet does an amazing job of narrating the stories! This is a gift for the whole family! 4. 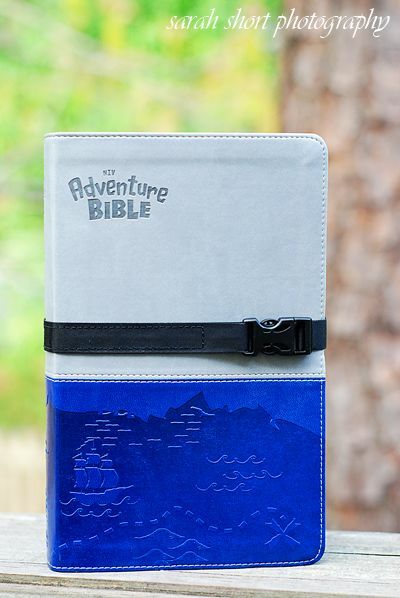 The Adventure Bible . This Bible is so well done and my boys love it! What do they love? : The detailed, full-color pages, the "Did You Know?" section containing interesting facts and details about the Bible, and the "Live It" section - full of ideas and hands-on activities kids can do to apply what they're learning. This is the bestselling Children's Bible on the market - and I can see why! 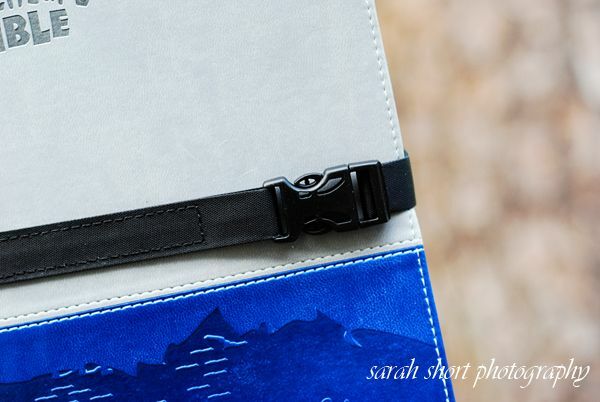 The duo-tone gray/blue leather and the clip closure make this Bible perfect for a little boy! But, you have a little girl! Well, how about a pink and green one? 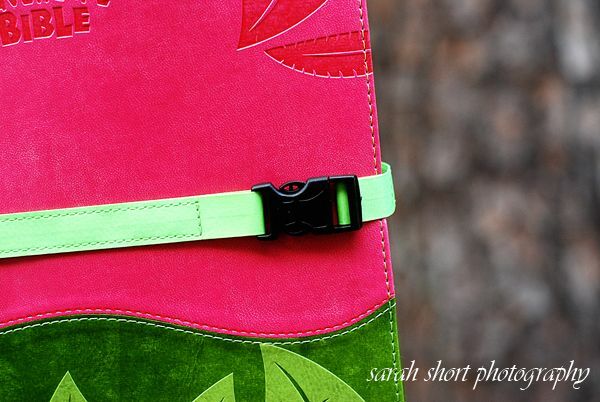 These colors are so sweet and girly - but adventurous and fun. And, the girl's version has the same clip-closure and duo-tone leather as the boy's. Here is everything you'll receive if you're one of the THREE winners. If you have more than one child, or if you have both boys and girls in your family, there are enough books and gifts that you can split them up and share them amongst all of your children. I wanted to give you all something really special this Easter - and this selection of books and gifts (over $100 retail value) are such treasures - each of them. And, I know that you will enjoy sharing these stories and Bibles together and making new memories this Easter. To enter, leave a comment on this post sharing one of your childhood Easter memories. You MUST leave an additional comment for EACH of these things that you do so that the random thingy will count each of your entries. If you only leave one comment letting me know all of the things you did, you'll only get one entry and well, we can't have that. To be sure the winners receive their "baskets" in plenty of time for Easter, this giveaway will only be open until Monday night, April 11th at 8pm. I'll let the random thingy choose a winner and I'll announce the winners on Tuesday mornin'. *If you're one of the winners, you can have your "basket" shipped to anyone you'd like. So, if you don't have children, this would make a great gift for someone who does! *Disclosure: All of these items were provided to me by Zondervan, to happily give away to you! In a home where we seldom had candy, my mom hid foil wrapped easter eggs and a bunny for us. Great memories, except for the year when the dog ate all of the eggs before we got up! I get your blog updates via e-mail! PS I really like your blog, besides on facebook! I don't comment very often, but read faithfully and have tried many of your recipes. Two of our favorites are the hot milk cupcakes and the pretzel/rolo snacks! I remember when I was really little I found my Easter Basket hiding in my parent's closet. So, for years after that the Easter Bunny put my basket in the bedroom closet. LOVE the idea of the books. We actually talked about getting the kids Bibles this year! Want to do it before it changes. 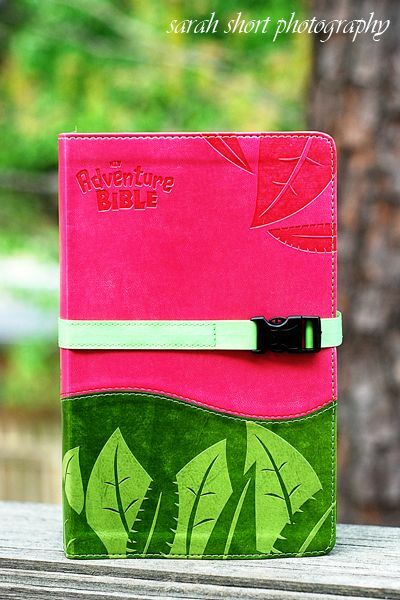 Did you know that they were re-writing the 2011 Adventure Bible to be gender neutral? Not a fan of that idea at all. Forgot to leave an Easter memory. For that, I'd have to say It's not Easter without chocolate crosses, and colorful eggs ALL OVER the house and yard! Thank you Sarah and Zondervan! really...the selection in the baskets is amazing- I love your picks, Sarah! I didn't grow up in a Christian home, but I do have fond memories of looking around the house in the morning to find my Easter basket and some eggs. And I'm enjoying making new Easter memories with my kids, as a Christian mom. oh sarah this is so much fun. i love it all!! my favorite easter memory was getting up finding our baskets, going to sunrise service at church, and spending the day as a family. my favorite memories have been spending easter with my kids and celebrating this season with them. We have many traditions for Easter. I am Greek Orthodox Christian, and Easter is my favorite holiday. I can't just name one memory, as I have so many.... Dying red eggs, making koulourakia (Greek Easter cookies) and of course the lamb that we cook every year! 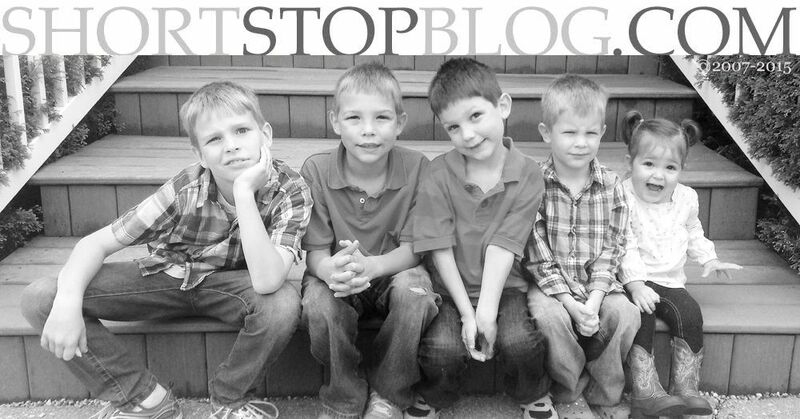 Subscribe to Short Stop via email! This is such an amazing idea Sarah!!! I never had the Eater Bunny growing up, and have been struggling how to have fun with Easter. Other than getting a new dress for church, we only celebrated Jesus' resurrection. Not that that is a bad thing!!! :) Even if I don't win this, you've given me some great ideas for this Easter! Thanks girl1!! I'm a FB fan!!!! I gave it up for lent though, so I won't be able to post this on my page. :) Hugs to you! We went to Easter Sunrise Service and then came back to our Easter baskets. In the afternoon, we would have a big family dinner (including grandparents, aunts, uncles and cousins) and then a huge Easter Egg Hunt. O what joy when you found one of those old Legg's Pantyhouse Eggs - those held the ultimate prizes! My Easter memories are about digging into my basket to check out what candy was in it. I remember there being gifts, but I wanted the candy!! My little girl would love all the books!! She loves for me to read to her. Thanks for such a great giveaway!!! I would love to win one of these for my grandson or grandaughter. I have many memories of Easter as a child... The one that sticks with me most is the tradition of roasting the lamb on the spit and dying red eggs with my mother. I loved waking up to see what goodies my Easter basket contained and then hunting eggs with my brother in the back yard! There were 5 kids in our family. My parents fixed a small basket for each of us with our name on it, and they would hide the baskets. If we found someone else's, we couldn't give it away. As we got older, they hid them better and better. They would play hotter/colder til we found it. I remember finding mine on the top shelf of the broom closet behind all the cleaning supplies. We also got new socks and undies for Easter. My little brother announced that to our pastor on Easter morning - my sister and I were mortified. I posted this on my facebook page!! My favorite Easter memory is getting dressed up for church and feeling super fancy. The whole day felt magical. I posted about this on my facebook page. I posted about this on Twitter. my favorite memory is getting to wear our new easter dresses to church that morning. My parents were domestic missionaries when I was little, so money was always quite tight. We were visiting my Aunt and Uncle in Florida when I was about 8 or 9 over Easter/Spring Break. It just so happened that while we were away for Easter brunch someone broke into their condo and took all of my mom and dad's money and their cameras. I remember how well my parents handled this event and how they remained focused on Jesus and how it was his stuff anyways. For me, it was a powerful moment, that just so happened to fall on Easter. oh my gosh, what an amazing giveaway! i would love these books for my daughter and goddaughter! my favorite Easter memory has to be the year my parents got my brother and i each a baby duck. We were so excited, and I just loved playing in the yard with him...he followed me everywhere! I put this up on my facebook account! I have always loved the treasure (easter egg) hunt. Also the performances at local churches. I grew up going to church then going to grandma's house for a big lunch and Easter egg hunt. My girls would love the girl basket. My favorite Easter memory is hunting for our Easter baskets before heading off to church. I'm a subscriber to your blog. I posted a link to the giveaway on my fb page. I posted a link to the giveaway on Twitter as well. So neat! What a great easter basket!! my favorite memory is prolonging the easter egg hunt- begging dad to rehide them every tmie we finally finished, he was the BEST hider, we had so much fun! I would love to win this for my niece or nephew. We had many traditions when I was growing up for Easter, and still do. In Greece there are Greek koulourakia that we made and I looked forward to them every year, I still do today!! my favourite memories are the sunrise service at beachmont christian camp with curlers still in my hair! and black jelly beans! still one of my favourites!! I like your blog on FB too!! and i can't believe that the berenstein bears have christian books out. they were some of my favourites when i was little!! I guess I would have to say going outside with all my cousins searching for the eggs and our baskets. And of course eating the candy was fun too! i also left a FB status link to your blog!! You are so awesome Sarah!! I posted a link to this giveaway on my Facebook page. I love the things included in this basket. I too am always looking for ways to make holidays and Easter fun and more importantly meaningful to my kids. Thanks for some great ideas! This isn't exactly childhood, but my favorite Easter memory is the Easter the first year I went away to college. One of my sisters is just two years younger than me and we were always at each others' throats when we lived together, but moving out made us a lot friendlier. I hadn't seen her in months and I was running late and barely made it in time for the service. I squeezed in to the pew next to her and for the next hour we couldn't stop giggling. I don't even remember what all was going on to make us laugh so much, but we just couldn't settle. Before the end my mother decided we were being embarrassing (no one else noticed) so she shunted me off to the other end of the family pew. I loved Easter Egg hunts in my grandmother's town - one person always found an egg with $5.oo in it. It wasn't usually me, but I was still excited. I signed up for emails. You do great giveaways, so thank you. My favorite Easter memory is going through the baskets my mom left for me and my DAD! haha! Sarah what an awesome idea for Easter Baskets. Please put my name in the drawings. My favorite Easter memories is decorating Easter Eggs every year and Easter Egg Hunts every year. I just posted a link to this giveaway on my Facebook page. We often went to visit my grandparents over Easter break...and they lived at the beach so we always had a great time! When we got home Saturday night, we would always search for our Easter baskets. Great memories! My Easter memories all involve pretty dresses, church, family, and LOTS of food. I might have to start to twit just to get another entry! GREAT giveaway sg. Very thoughtful and generous. Love you! Favorite Easter memory: Getting dressed up for church, including a new special Easter hat. I have two brothers and I was the only one that would get to wear a hat to church. Easter was always spent with my mom's side of the family. We would eat lunch and then all of the kids would have to stay in the window-less basement while the adults prepared our egg hunt! fun times! This a great giveaway, thanks! I am a subscriber through google reader. My favorite childhood memories are getting up early and going to sunrise service. We used to have a delicious breakfast afterwards! Already a subscriber rss feed, woohoo!!!! My mom always made us bunny & easter egg chocolate lollipops!! What a great giveaway for Easter! Thanks for the opportunity Sarah. One of my fondest memories, were traveling to Georgia to visit my grandparents as a child. I loved having an easter hunt while feeling the warm air and looking at all the blooming forsythia and pear trees. And I'm certainly craving that warm air right now!! I subscribe or "like" you on facebook too! I'm subscribed to you in google reader. Trying to find my twitter account to post....lol!! I linked to your page on my FB account. My favorite Easter memory was: My mom used to hide Easter eggs for my sisters and me on Easter morning and we would hunt for them. One time, about a week after Easter, we smelled this mysterious rotten egg smell in the living room. We finally discovered a rotting Easter egg hidden in the piano bench that we had all missed. My favorite childhood Easter memory were the special "click click" shoes we got to wear. You know, every little girls dream to have her shoes click like her mama's heals. We got to wear them with our Easter dresses, bonnet and gloves. Before we left for Mass we twirled around and around and made click click noises with our shoes. Thank you for having such a great message to your posts and always finding a way to incorporate the Lord! May you and your family have a Blessed Easter! I'm a fan of your's on Facebook! My favorite Easter memory is how we always searched for our Easter baskets before church and filled our pretty little purses full of candy! What a great giveaway! My favorite Easter memory is sharing a special Easter brunch with my extended family every year. The meal was a bit different from year to year, but it always included a spiral ham. Fun family time was the best! I shared about your giveaway on Facebook! 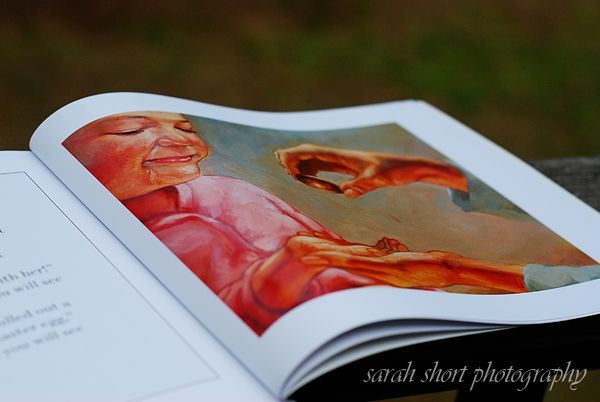 BTW, we adore the Jesus Storybook Bible! We read it daily w/ our kids. We've nearly worn out our second copy...pages falling out and cover barely holding on- so it's time for a new one! Childhood memories? It's what we still do to this day as a family. We dye easter eggs and then have a "fight off" after Easter dinner. Sometimes we cheat and add super glue or other hopeful remedies to ensure that our egg is the last one uncracked! We always left out a carrot and some lettuce for the Easter Bunny, and there was always some nibbled away the next morning. My father was often "gone" as he was in the military and seemed to always be somewhere else on any important holiday. We often spent our Easter at the Officers Club with other kids who's moms had decided that comming to a pre-made Sunday Easter Brunch was easier than trying to make a Sunday Lunch for kids and herself. One Easter, dad even left that morning and celebration was just not on the menu. However, a few years ago my husband who is often in the army was deployed. My parents came to our house and we ended up at that same Sunday Brunch 20 something years later. My kids were doing all the things I had done without my father now without their father. However, this time I was there with my dad. It was so much fun. I ended up playing some of the Easter games for kids with my dad. It was now 20 something years later but God had been so good to give me back a moment of childhood I hadn't gotten a chance to have. So even as an adult this became a great "childhood memory" as dad and I played the egg toss and helped my little guys find Easter Eggs. My favorite memories were when I was a kid there was just a feeling in the air on Easter morning. A wonderful feeling. The weather was perfect, I got to wear my dress and go to church. Then hunt eggs and have a fun family time. I didn't grow up knowing the Lord the way I do now, so Easter means way more to me today. But I still love those things about Easter. 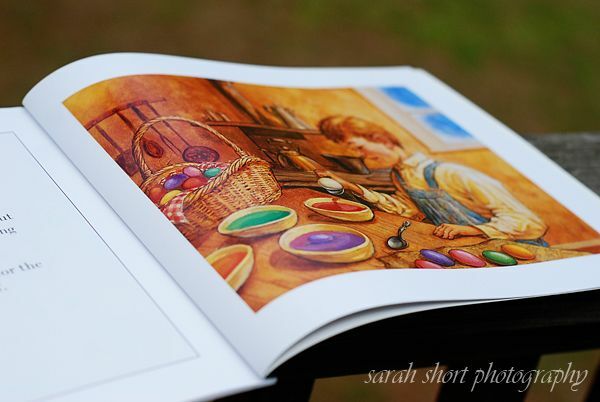 My favorite Easter memories revolve around coloring eggs and the smell of vinegar! I now follow you in my Google Reader! so cute! i'm already an email follower! and i've liked on fb too! and posted a fb link! My favorite memory was finding the hidden Easter baskets on Easter morning, then we would sit down and read the account from the Bible. I remember dying Easter eggs and the beautiful white plastic basket filled with candy that I'd get Easter morning. I did not grow up in a Christian home, but my husband and I are Christians and are raising our three daughters to follow Christ as Lord and Saviour. having Easter dinner at my grandmas. She is no longer with us but I find myself trying to recreate the holiday feelings we had at her house with my kids. I 'Like' Short Stop on Facebook! Thanks for offering such a great giveaway! I retweeted your giveaway information! My parents wanted Easter day to be about remembering the resurrection of Christ so we did Easter baskets the night before. They would set up a scavenger hunt with clues leading us kids to our Easter baskets. It was such a good memory that we've continued the tradition with our kids. They love doing the scavenger hunt and it makes the Easter baskets that much more exciting. My favorite Easter memories all revolve around church on Easter morning, and I wouldn't have them any other way. Getting dressed in our new dresses, hats, shoes, socks, and gloves; the Easter Sunday school program; the continental breakfast with danishes and pastries; and then the Easter church service. Lots of wonderful moments! I subscribed for the emails! My favorite Easter memory is that my mom always would put out butter in the shape of a lamb for dinner. As we got older, the egg hunt started to include plastic eggs with money in them! What a treat! I posted a link to your post of FB! I posted to FB! This is fun! I feel like I'm filling out 4 little tickets and dropping them in the jar! Thanks for the give away, Sarah! Great books, and I agree... books are wonderful basket stuffers! I subscribed to Short Stop. Posted a link on Twitter. Our parents would hide easter baskets and go to church together, followed by dinner with family. What a fun giveaway! Wow. My daughter would love this. My favorite memory of Easter is going to church and visiting with family. Easter has always been big in our family. I was one of four girls and every Easter morning we would get a New Easter dress, hat, shoes and sometimes white gloves. We would get all dressed up and head to church in our fancy new clothes! I can't really think of a specific Easter memory. I do know that most of my Easter's involved going to church, followed by a delicious ham meal at Grandma's, and then probably some Easter Egg hunting in the backyard. We don't really do Easter baskets at our house, but sometimes we give our kids a new Bible, devotional, or an Easter story book. Our church usually has a big Easter Egg hunt after the service. What a great gift! My favorite Easter memory is when my Sissy (Grandma) would crochet my Cousin, my Sister, my Aunt, my Mom and me all the same Easter outfits and we always had a big Easter get together at the park with a big Easter egg hunt. It was so special! My Sissy is gone now, but I still have pictures as a great memory.